Industrial production declined for the eighth time in nine months, by 0.2%, pretty much in line with Econoday Consensus estimates. Industrial production continues to sink, down 0.2 percent in September which is slightly better than the Econoday consensus for minus 0.3 percent. The manufacturing component continues to sink, down 0.1 percent for a second straight decline and the fourth decline in five months. Industrial production was revised sharply upward for August, from an initial decline of minus 0.4 percent to only minus 0.1 percent. But the improvement is due to sharp upward revisions to the utility and mining components, less so for manufacturing where the revised decrease now stands at minus 0.4 percent for only a 1 tenth improvement from the initial reading. Motor vehicle production, which swung up and down through the summer, settled in with a 0.2 percent gain for September. Looking at the long-term trend, vehicle production is at the top of the report with a year-on-year gain of 9.4 percent in strength underscoring that demand right now is domestically based. Business equipment production, which is closely tied to exports, slipped 1 tenth in September for a year-on-year increase of only 1.8 percent. Consumer goods, which are centered for the domestic market, gained 0.2 percent for a year-on-year rate of plus 2.6 percent. Overall capacity utilization slipped 3 tenths to 77.5 percent with manufacturing utilization down 2 tenths to 75.9 percent. Note that excess capacity in the manufacturing sector is a factor that is holding down the costs of goods. Turning quickly to the other components, utility production, driven by September's unseasonable cooling needs, jumped 1.3 percent and also now 1.3 percent in August as well, up from an initial reading of plus 0.6 percent. Mining production, which has been pulled lower by commodity prices, fell 2.0 percent in the month with year-on-year contraction standing at minus 5.7 percent. Mining production in August is now revised to unchanged from an initial decline of minus 0.6 percent. Bloomberg notes "The industrial sector accounts for less than 20 percent of GDP. Yet, it creates much of the cyclical variability in the economy." 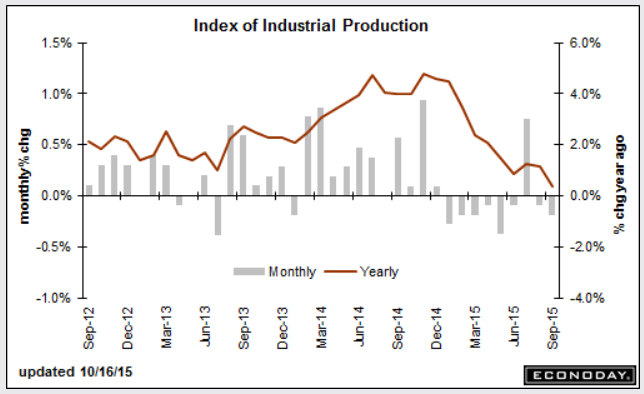 With the exception of July, industrial production has been weak since late last year.